Award-winning exam engine ensures the most optimal learning experience. Our RES answers come with explanation to help you understand the background to the answer. You can review each question right after attempting it, instead of having to wait till you have answered all the questions in the exam. This leads to better retention of the correct facts. Strong focus on scenario and case study questions, as well as on important keywords and numbers. A report of your attempted exam will be sent to you, together with the time spend on each question. "I find the RES questions on 100Questions to be very useful in helping me pass my exam. I would recommend it to my friends who plan to take the RES exam. "This is not just a commercial exam store but an ecosystem with relevant (and free) articles, expert support and comprehensive forum. Well done!" 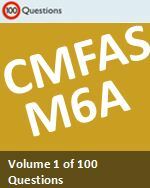 CMFAS M6A (100 Questions) - Securities and Futures Product Knowledge - tests you on securities and futures product knowledge, including: fundamental, technical and statistical analysis, structured products, key risks, structured funds and ETFs, other financial derivatives, CFDs and knock-out products.